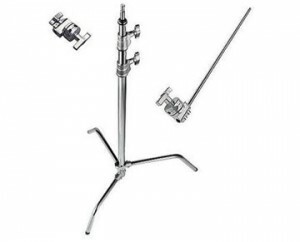 We offer combo stands with and without wheels, and also have rocky mountain leg and boom arm options. Combo stands allow you to mount either a baby- or junior-sized fixture on the same stand, without an adapter. Most of our rental light kits include stands, but many individual lights do not. You may also find you need a particular stand for a your specific production needs. If you’re not sure,just ask us for advice when you place your rental order. The price listed below is for a standard combo stand. Please use light stands safely: always use sandbags and common sense. The beefy baby stand gives heavy-duty support for lights with a baby receiver. Triple risers lift your light up to eight feet in the air. Baby stands have a 5/8″ baby pin. Some of our light kits include stands, all individual lights do not. Just ask us to make sure you have enough stands when you place your rental order. This is our basic and most popular light stand. Triple risers lift your light up to eight feet in the air. Baby stands have a 5/8″ baby pin with a reversible 3/8″ – 1/4″ screw thread on top, for easy mounting of anything with a baby receiver. Some of our light kits include stands, but many individual lights do not. Just ask us to make sure you have enough stands when you place your rental order. 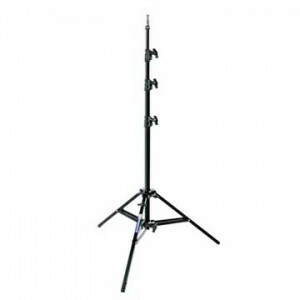 The 40″ C-Stand with grip head, knuckle and arm is a classic. Use one to mount your flags, nets, silks, or other light modifiers. Get more than you think you’ll need, and don’t forget sandbags to keep your stands safe. 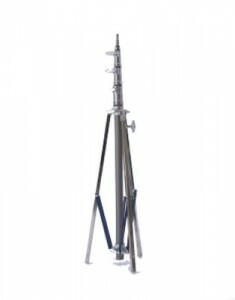 We also rent short 20″ c-stands. 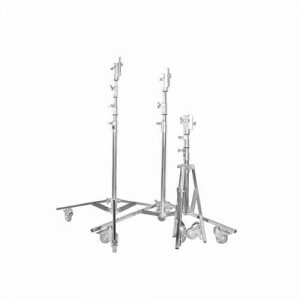 You can request turtle-base or fixed leg C-stands and we’ll try to accommodate, where possible.